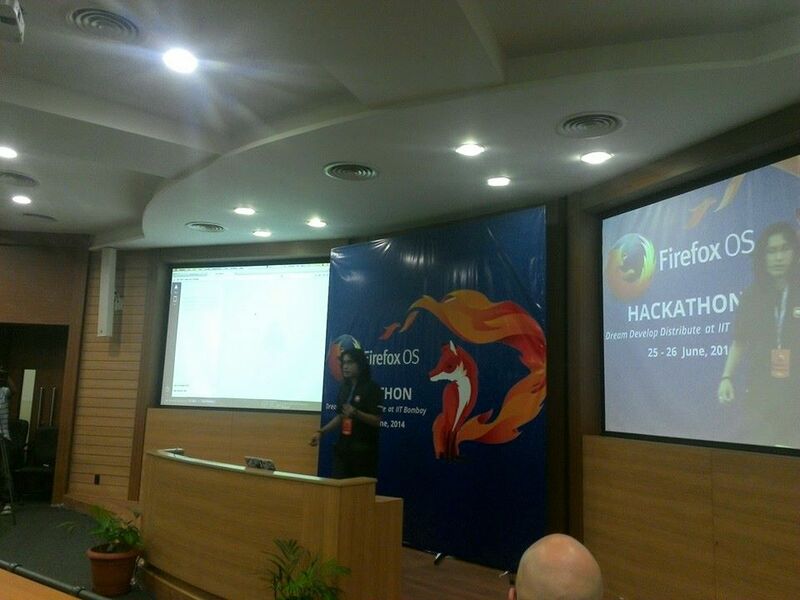 June 5, 2014, the day when I received a mail thread from Soumya-Da stating that a Research Assistant at IIT Bombay named Mr. Santosh Shingare and Mr. Rahul Deshmukh, along with their Firefox OS Community, has proposed an idea of conducting a 2-day Firefox OS Hackathon event on June 25. Since the duration of organizing was pretty less, decisions had to be taken quickly and equally accurately. I was finalized as Mozilla Presence Organizer. It was my debut event that that too, on a grand scale. Soumya-Da and Kaustav-Da, helped me getting through all the pre-event activities like Swags Request, Budget Request, etc. There was even an informal discussion held at Mozcamp Beta at Bangalore. Santosh sir, Manish Goregaonkar, Harish sir and Rahul Sir took care of the entire infrastructure related to the event. First day of hackathon began with introductory sessions. Fredric Harper, Senior Technical Evangelist at Mozilla, who was present at Mozcamp at Bangalore extended his stay to attend Hackathon. This was delightful news for all of us. His lecture was awesome. I clearly remember that the keynotes and suggestions (regarding how the talk and slides should be) which he delivered at “Developer Relations” session at Mozcamp were clearly implemented by him at this lecture. That was an exact dose of training for me, as I got to see the implemented version as well. Next was Soumya-Da’s talk about Dev Tools and Kaustav’s talk on WebIDE, Fx User Profiles, Inspector usage. Then Jai Pradeesh demonstrated Cordova/Phonegap. After the talks, the FxOS Hackathon was declared as “Began”. The 5 hours of Hackathon Day1 passed by enthusiastically where all the participants came up with new ideas and tried their level best to implement them. Few of them were familiar with FxOS earlier and had started working on Apps. This session continued till 12 noon next day (Day 2). I interacted with the interns about their ideas and their implementation progress. And their efforts were extremely inspiring. Within a short duration, they had developed a range of worth-watching apps. That was a moment of proud for all Mozillians as the real aim of the event was getting fulfilled. There was Pro-apps like Wireless Touchpad, Keystroke Based Authentication, M-indicator, Wiki Speak, Circuit Simulator and also a number of start-up game apps. The hackathon came to an end by 2 pm, after that was session held by Jai on Validation and CSP (Content Security Policy). He also mentioned about the factors we must avoid, e.g. Avoiding inline scripts and linking the jquery on the web (it would be beneficial to download it to local repository). The sessions ended by throwing a light on building blocks of Firefox OS. Then was a prize distribution session appreciating the notable apps and developers. Interns came up with a number of doubts and suggestions which were answered very effectively by Mozillians. The 2-day session came to an end with a group photo and evening snacks. MozCamp : a great experience !